MENDOCINO Co., 2/02/19 — After a brief reprieve of sunny skies and warm temps this week, winter weather has returned to Mendocino County, with more rain, freezing overnight temperatures, high wind, flooding, and possible hail and snow forecasted through Tuesday morning. According to the Eureka office of the National Weather Service, rain totals are forecasted to be between one and half to five inches around the North Coast between Friday evening and Tuesday morning. Snow levels are predicted to reach 3,000 feet on Sunday, with possible heavy mountain snow, and then drop to 1,000 feet on Monday, with up to two inches predicted in lower elevations — meaning much of northeastern Mendocino could see some snow, and road conditions may be difficult. Inland temperatures may also drop to the high 20s F by Monday evening. PG&E has also set up staffing centers in Ukiah, Fort Bragg, Clearlake, and Fortuna in order to respond to outages quickly. Chains may be required in mountainous areas, and travel is not recommended unless necessary. Rockslides and other hazardous driving conditions are forecast across the North Coast. There is also a flash flood warning in effect through Monday, particularly for areas in the burn scar. You can check the forecast for your specific area at weather.gov. Information about current road conditions can be found on the CalTrans Quickmap road information page, as well as the California Highway Patrol current incident page. You can report an outage and check for information about current outages at the PG&E outage page. You can find information about river flooding levels through the NWS flood level gauges here. 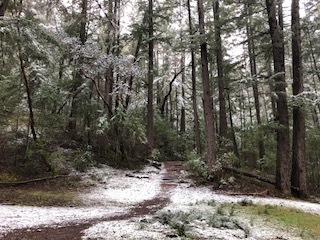 The Mendocino Voice will also be providing updates on our website, Facebook, and Twitter — send us our snow photos to share!